We will learn how to sort wild and tame animals. 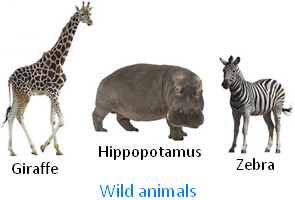 Some wild animals are Giraffe, Hippopotamus, Zebra, ..... etc. Some tame animals are Buffalo, Goat, Cow, ..... etc. In a zoo, we see wild animals. They have been brought from all over the world. They come from many habitats—the forests, high mountains, muddy swamps, snowy, cold areas. Let us find out more about some of them. The huge rhinoceros is a vegetarian! There are only a few of them left. They can be seen in Assam, a state of India. Some other Indian animals are lion and tiger. These are also wild animals. They usually live in forests. Some animals are deer, peacock, tiger, lion, elephant, monkey, wild buffalo and cobra. Different wild animals are found in different countries. Some interesting animals from Africa are hippopotamus, zebra and African elephant. Animal is found both in India and Africa are elephant and zebra. Animals can even be found in the very cold, snowy areas of the Arctic. Fish live in the seas of Arctic. Polar bears catch them for their food. Some animals are gentle and friendly. People can keep them at home as pets. Some people keep strange pets like birds from other countries, snakes, rabbits and white mice. 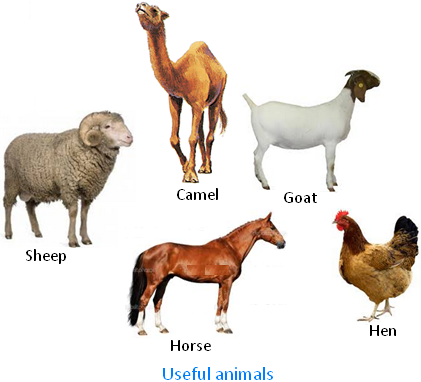 Many animals are useful to us such as cow, goat and buffalo. People often keep these animals in their homes. They feed them and look after them. These animals give us useful things. Some of the wild and tame animals help us in more than one way, a list of ways in which these animals help us and their uses.